As a builder, I am intrigued by the change in the quality of sound that emerges as I shift some of the hundreds of elements that go into an instrument. A little change in the depth of the carving here, the movement of a brace there, using engleman instead of sitka for the top, and it feels more like magic than construction. Each specific blending of wood, technique and time creates a unique sound never before heard. While I strive for perfection in everything I do, I recognize that it is an impossible dream, and relative at best. Since no two hand-made instruments will ever be identical, technical perfection will always be an illusion. However, the real perfection happens when one of my instruments has the perfect look, feel and sound for a particular customer. Modern technology and machines can turn out thousands of "perfect" looking instruments with ideal measurements and flawless detail. And, for the great majority of players, these instruments can provide a lifetime of satisfaction. I believe something more is possible. If wood is carefully chosen, admired and lovingly worked with patience, respect and gratitude, it vibrates differently – often magically. 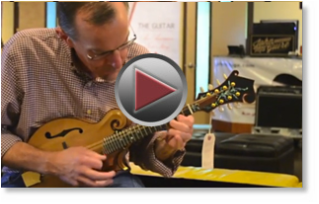 The very time spent on an instrument imparts a quality that no machine will ever match. The slight "imperfections" that come from the human touch become signatures of love, a constant reminder of the maker. These things create the soul of the instrument; an intangible essence that cannot be described, but can be felt and heard. there! I love the Koa/Red Cedar F-5 tone and response. Beautiful work and playability! 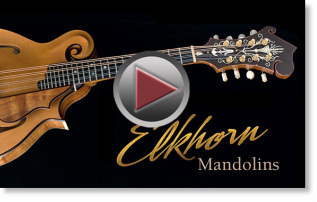 Just terrific mandolins for sure! He made some video footage of me playing them both and hopefully he has sent them to you. 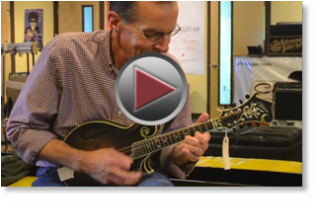 Watch a video of Adam Steffey playing an Elkhorn Mandolin at Carter Vintage Guitars in Nashville, TN. Carter Vintage Guitars in Nashville, TN.